Heaven’s Best Carpet Cleaning Jacksonville NC offers carpet cleaning, rug cleaning, upholstery cleaning, and more! Our carpet cleaners give you the best value and we are confident that Heaven’s Best is the only carpet cleaning company you need. Call to talk to your local carpet cleaning technician to find out which cleaning service is best for you. They can answer your questions and schedule an appointment. We are excited to be the owners of Heaven’s Best Carpet and Upholstery Cleaning’s twentieth North Carolina franchise. Heaven’s Best Carpet Cleaners Jacksonville NC, now serving Morehead City, Hampstead, Topsail Beach areas, and all of Onslow, Pender and Carteret counties. After living in North Carolina (NC) for many years we purchased a vacation home on the coast. We fell in love with the people and culture of that area. When we decided to leave the corporate world and start our own business Jacksonville, NC and the southern North Carolina coast was the perfect place to locate it. 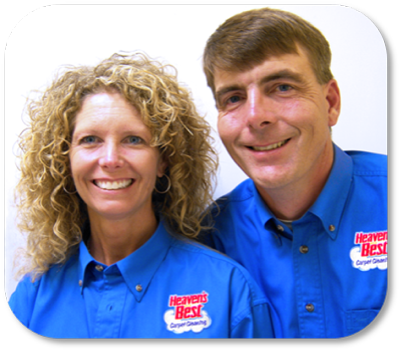 After intensive research, Heaven’s Best Carpet Cleaners stood out as the ideal business partner. Heaven’s Best is a family owned, faith based, and customer driven franchise. It fits us perfectly. With our years of experience in customer service and finance we knew we had something different and special to offer. We found the Heaven’s Best process really does get carpets cleaner than other methods. It dries in just one hour and leaves no residue to re-attract the soil. Their environmentally friendly and proprietary cleaning solutions are safe for children (even babies) and pets. Their goal is to be as “green” as you can get and still get the job done – all things that were important to us. As we investigated, we also saw that the Heaven’s Best Carpet Cleaners eco-friendly solution gets out stains and spots that other cleaners do not. That was a real bonus. We found out no one else has this solution – we couldn’t get it with any other franchise or any cleaning supply source. The final closer was that Heaven’s Best Carpet Cleaners also offered tile and grout cleaning, hardwood floor polishing, as well as upholstery and leather cleaning. We can also offer restorative cleaning along with maintenance programs for both residential and commercial needs. We will be able to offer a well rounded group of related services. We are excited to meet new people, offer a unique carpet cleaning experience, and grow our business here in North Carolina (NC). Give us a call . . . we GUARANTEE you will not be disappointed. Your carpets will be the envy of the neighborhood! The best carpet cleaning I have ever had! Very professional business practices. Thank you Stefan. Excellent Job!! Brought carpet back from previous BAD cleaners! I'm very pleased with all they did ant tried to do. They went bar in trying remove some black stains on my carpet. My carpet looks great; very happy with the service and will recommend this company to my friends. I love how well my carpets looks and how good the house smelled! Would highly recommend to others! Very personable, professional, great job!